Opened in 1897 after the collections of the town and the Dunois association of history and archaeology were brought together, this Museum of France holds eclectic collections. A magnificent collection consisting of 3,000 stuffed birds and mammals from all over the world, bequeathed by the Marquis of Tarragon in the nineteenth century. The Egyptian art room holds numerous pieces from the excavations carried out by Emile Amélineau in Abydos, dating from the Thinite period (3,100 – 2,700 B.C.). Funeral art is represented by two mummies and their boxes from Antinoe. The museum holds an Eastern collection consisting of porcelain from the East India Company, Noh theatre masks, children’s toys, numerous knives and a collection of jewels, and various works of Islamic art. 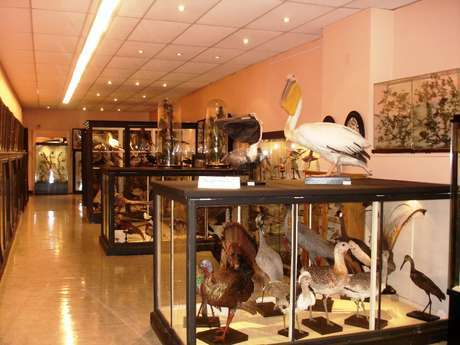 The museum holds paintings by acknowledged local artists and also historical and archaeological collections. One of the rooms explains the events of 1870 in Châteaudun while another reproduces a La Beauce interior from the nineteenth century.